If you feel that you are in “control” of your diabetes by being able to keep your blood sugar level in a desired range with insulin injections or medications, you must ask yourself a few questions. Where did the blood sugar that your medications supposedly made disappear from the blood go? Did it exit your body? If your diabetes care provider tells you that the sugar was “metabolized,” meaning used by your cells, ask for the evidence of this. Moreover, did you know that injecting insulin and medications that release your own insulin are potentially dangerous to you? 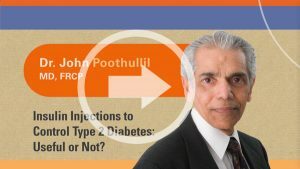 I gave a talk recently on why insulin is a ” troublemaker” for people with type 2 diabetes. Here is a 15-minute video segment from my talk. In it, I explain the problems of using insulin to “control” your diabetes. The fact is, even with medications or insulin injections, sugar remains in the body disguised as fat, which can lead to blockage of blood vessels and diabetic complications despite maintaining blood sugar “control”. 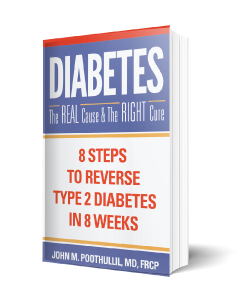 The most effective way to reverse diabetes is to avoid grains. If you don’t put carbs in your mouth, you can’t increase your blood sugar. It’s a false sense of security to take insulin and believe you are managing your diabetes.